On their wedding day, Apollo left Irene because he was afraid and still has many questions. After 3 years, Apollo finds Irene. He tries to win back Irene but, Irene is still hurt for what Apollo did. Irene tries to take revenge by acting that she has an amnesia. Can he still right the wrongs he did? 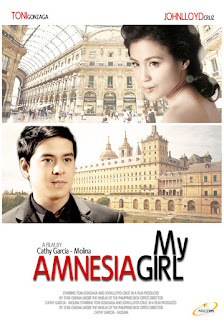 My Amnesia Girl is a 2010 Filipino romantic film starring John Lloyd Cruz and Toni Gonzaga. It was released by Star Cinema and directed by Cathy Garcia-Molina. The film is the highest grossing Filipino film of 2010.